Finally, a post that is not solely about the pets (don’t worry, pets are included). I got this very lovely rug on CL today. It’s 14 feet by 9.2 feet, which happens to be a very harmonious fit for the library. 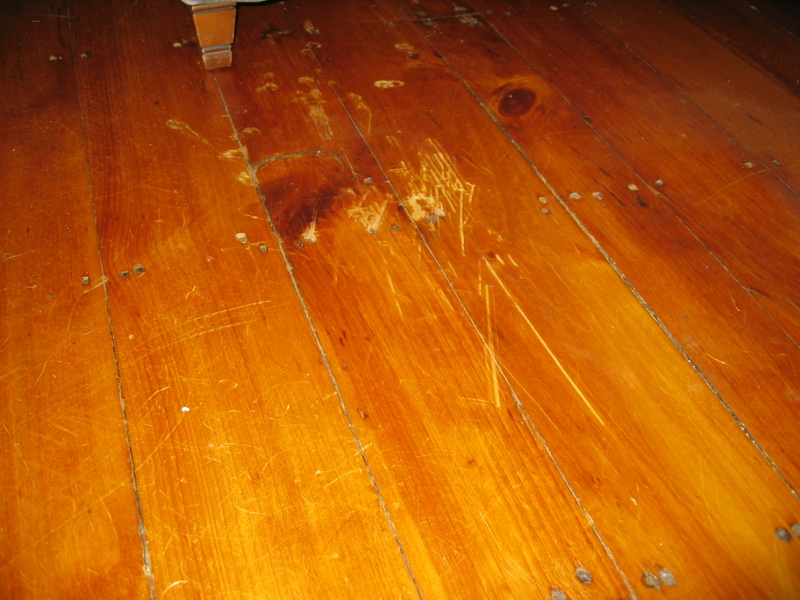 The plain wood floors looked good from a distance, but up close they were covered in marks (dog nails and me heaving furniture around). 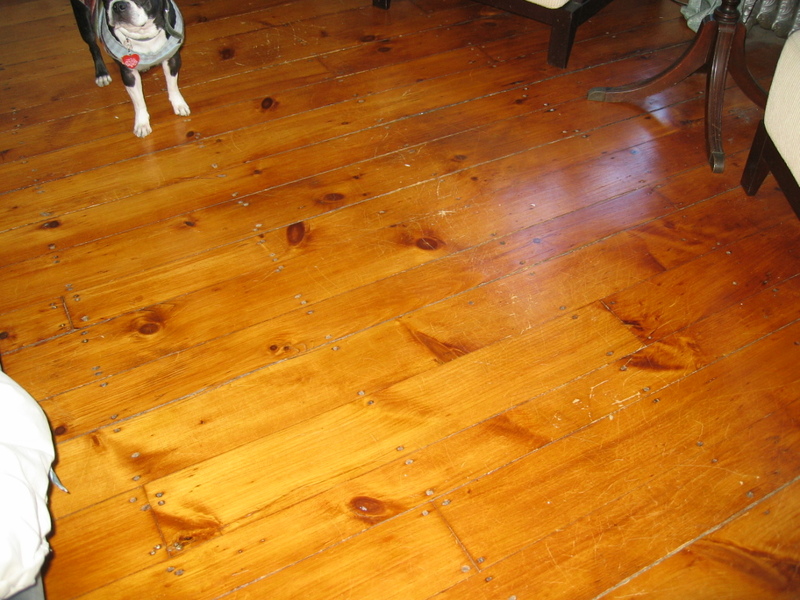 The floors in the house are all yellow pine, which is a soft wood, and they were never meant to be bare — the Victorians of my house’s era (1872) were big fans of wall to wall carpet. This was before the big “hygiene” phase. 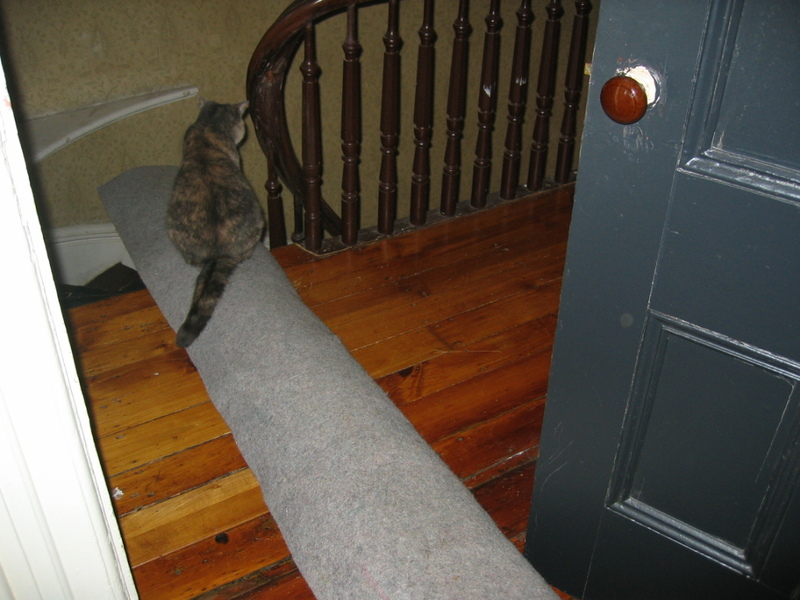 So the rug is great, it makes the room a smidge warmer, and it’s very nice to walk on. Also cat and dog approved. So… yay! The first house “project” for 2012. One down, a gazillion to go. 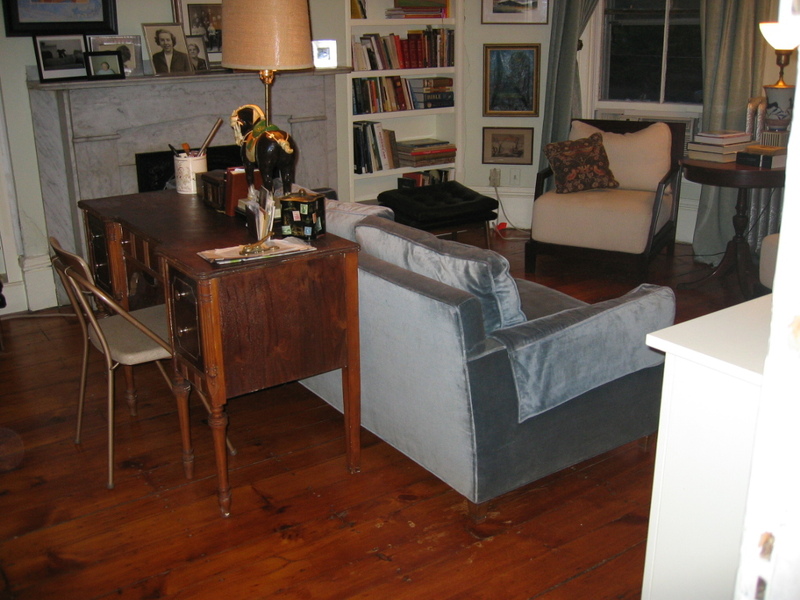 Room with bare, cold floors. Plain floor with deputy inspector. Chief rug inspector makes sure the pad isn’t filled with helium. Close up of rug damage. Rug pad going down. 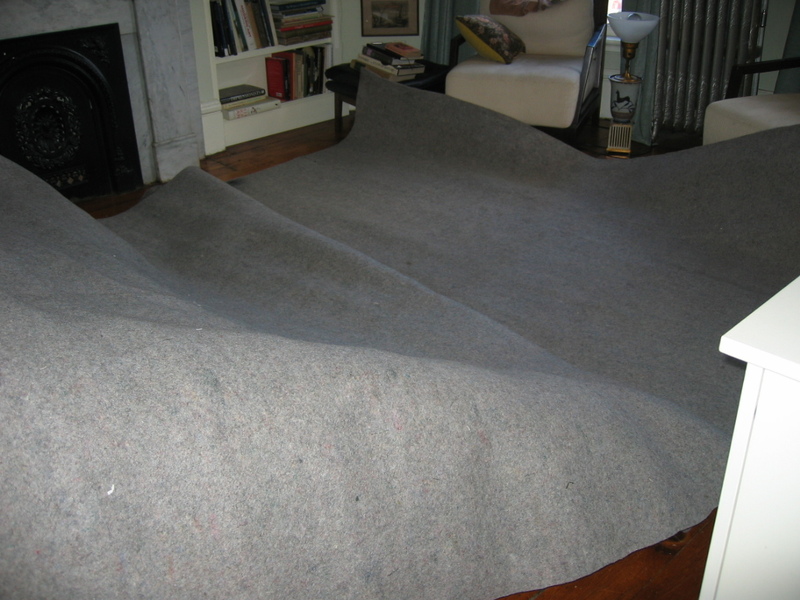 Pattened rug laying method includes draping pad over couch. Chief rug inspector in hallway. 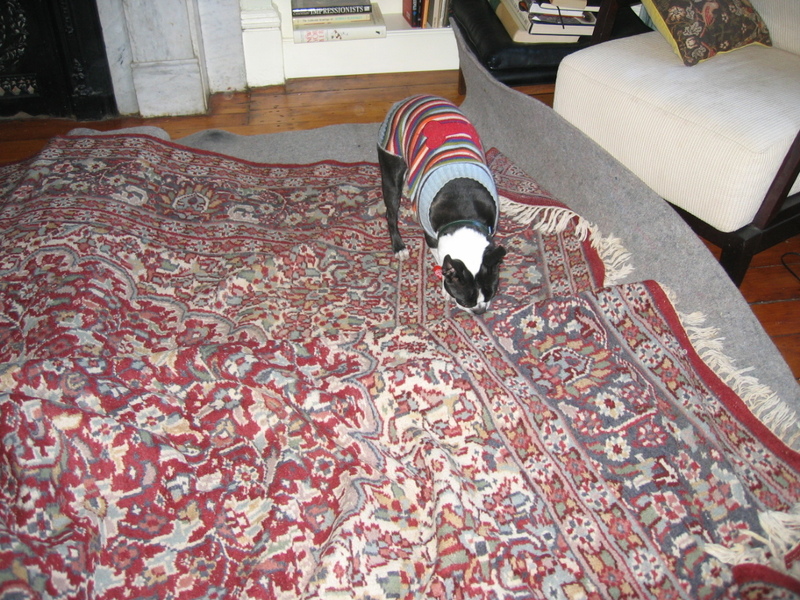 Rug inspection continues. This part passes. Final bit of rug going down. Rug installed — looks pretty great, eh? 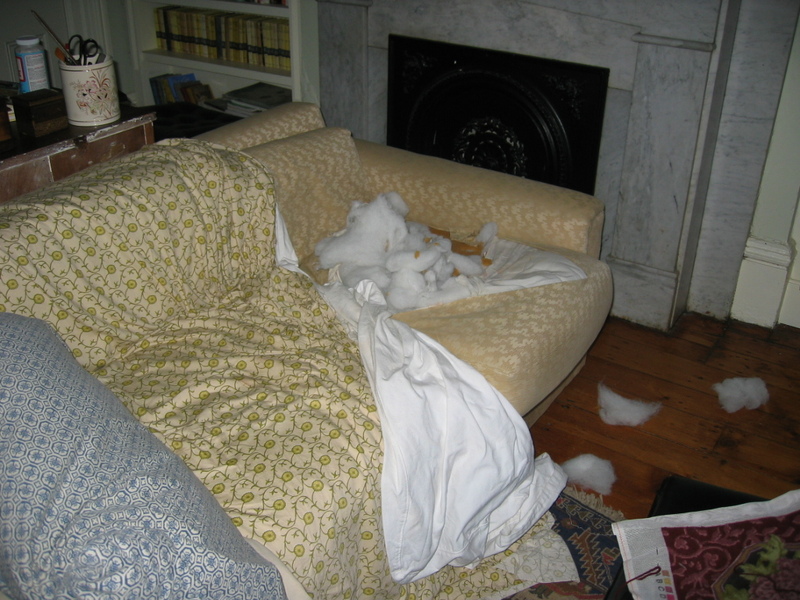 The couch in my library was ill-treated by Skunkie over the years. During the Corn Cob Incident (she had a corn cob rattling around in her system for four months and it was discovered after massive inky spewing and several trips to the vet, culminating with a surgery that found the offending corn cob), she befouled the couch. During the Itchy Years, she rubbed her raw bleeding hide against the couch. 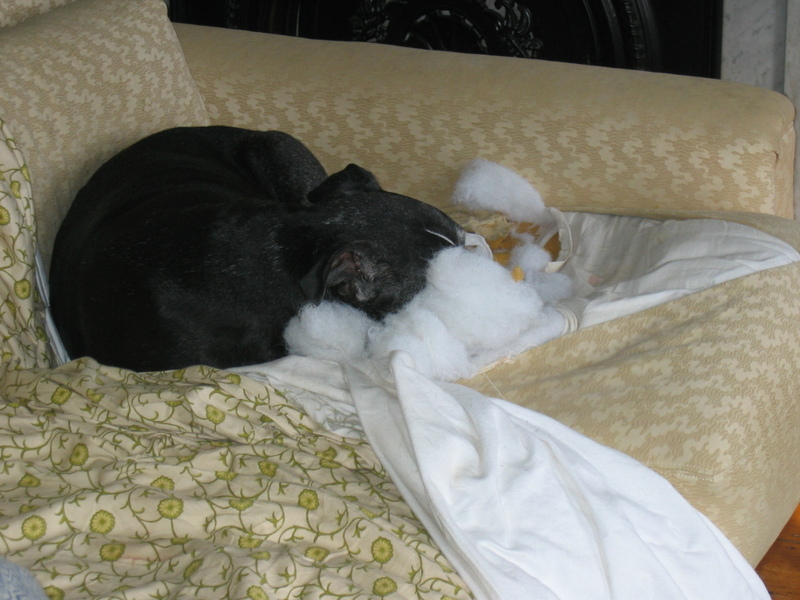 And most recently, Just For The Hell of It, she destroyed one of the cushions. So I started looking for a new couch on Craigslist (where I look for everything). I looked high and low in the free section (ibid) and every time I saw a freebie I liked, it was gone. 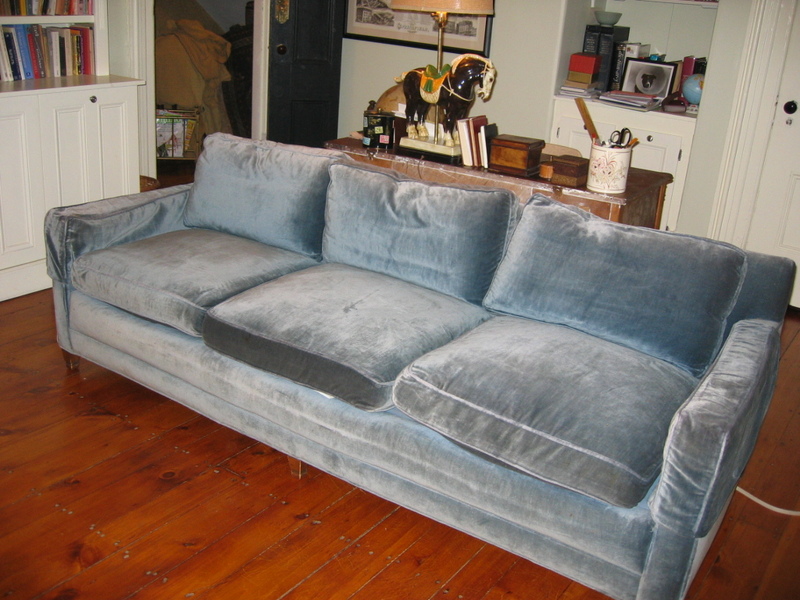 So I expanded to the for sale section and searched for “blue velvet couch.” I found one. Kind of dim photo, but it looked pretty good. The post said it came with slipcovers, which I thought would be helpful for dog effluvia. But the ad was from April, so I figured it was already sold. I gave it a shot and emailed the poster. The couch had not been sold — hooray! So off I went to look at it. What a beaut! 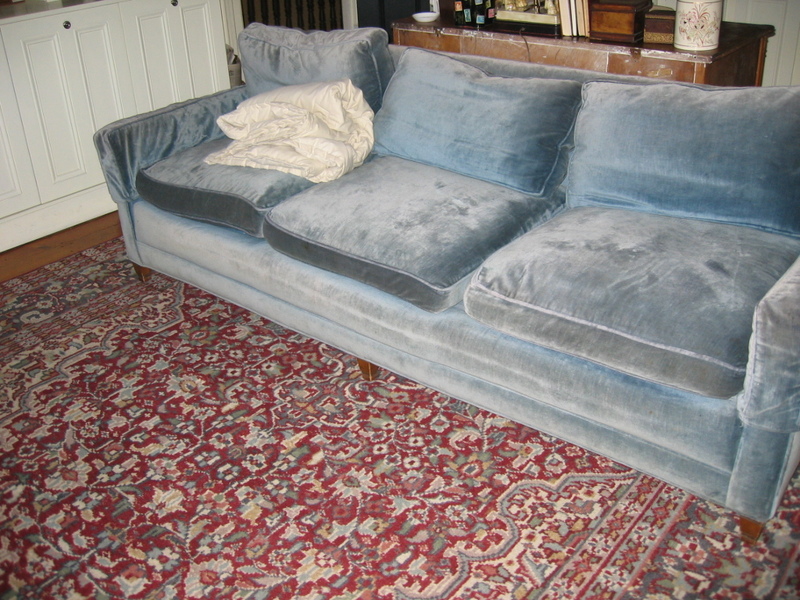 Rich, silky, heavy blue velvet. Not a scratch, hole, or dog barf stain on it (maybe a few coffee stains). Perfectly acceptable slip covers. Down I sat…. oooh — is that down feathers I feel? Why yes, yes it is. Why? 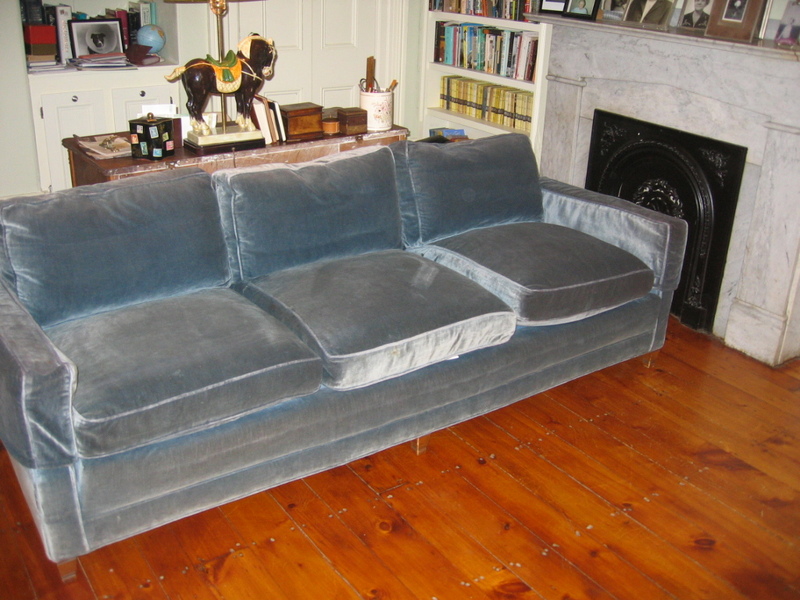 Because it’s a super duper fancy couch — Henredon something something Schoenbeck. What do I know from fancy couches? Well, I know this, I’ll never feel right sitting on a humble couch again, because old fancy boy is fantastic. Rob and Toli (thank heavens for friends with friendly POSSLQs) heaved it up the stairs (those fancy components are heavy). 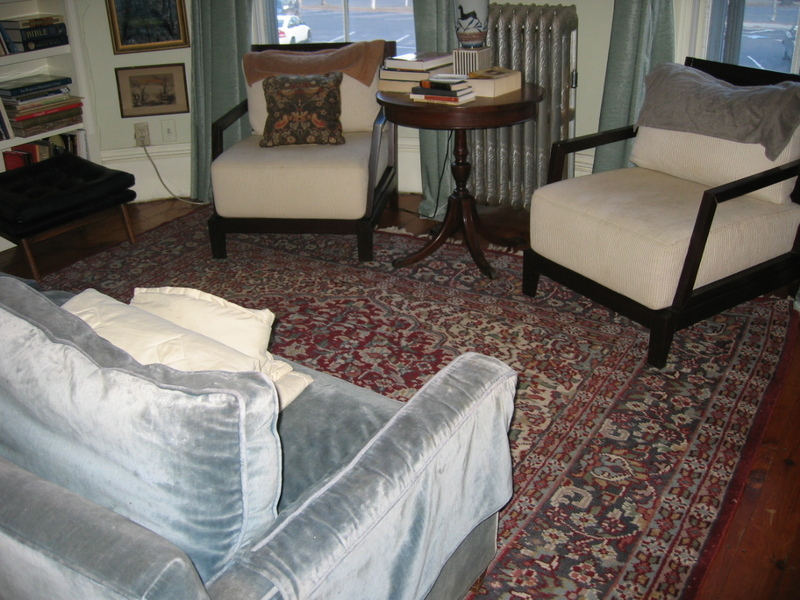 I took out all the rugs (see Skunkie) and it’s very clean and sharp up in the library with the fabulous couch! 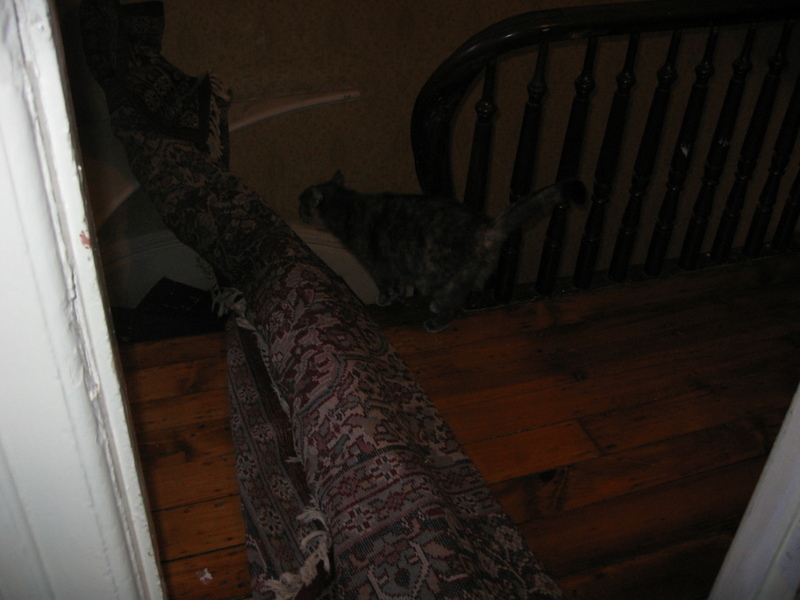 One in one out is in effect, so I’m trying to unload the old couch on…. Craigslist, of course. The couch and room look better in person than in the photos, but they look pretty good in the photos, too. Skunkie has fangy fingernails of doom. It requires a vet, a vet tech, a muzzle and me to trim her fingernails. So it gets done twice a year (and it costs fifty bucks — pesty dog!). So she recently tore through the happy sunflower sheet that had been draped on the sofa in the library to cover up the seat cushion through which she had previously torn. I wanted something a bit more durable than that thin old sheet (which I repurposed to cover up the cushion). So off I went to Savers to see what they might have. I found a loverly furniture throw (can you believe it — just what I wanted) and it was in the half-price tag color! So, the original price was $5.99, but half-price (with tax) was $3.17. I was short a penny, but they let me slide, so I got this lovely throw for $3.16 — hooray! And it’s Skunkie-approved. Here she is preening and sleeping on the new throw. Skunkie has always had some sort of an issue with one particular cushion on the couch in the library. Over the years, she has scratched and pawed at this one area. Now unlike most of my belongings, I bought this one new, from a fancy pants furniture company (in the clearance area, though), so I don’t think a family of squirrels or something lived in it previously (‘tho maybe that’s why it was on clearance?). 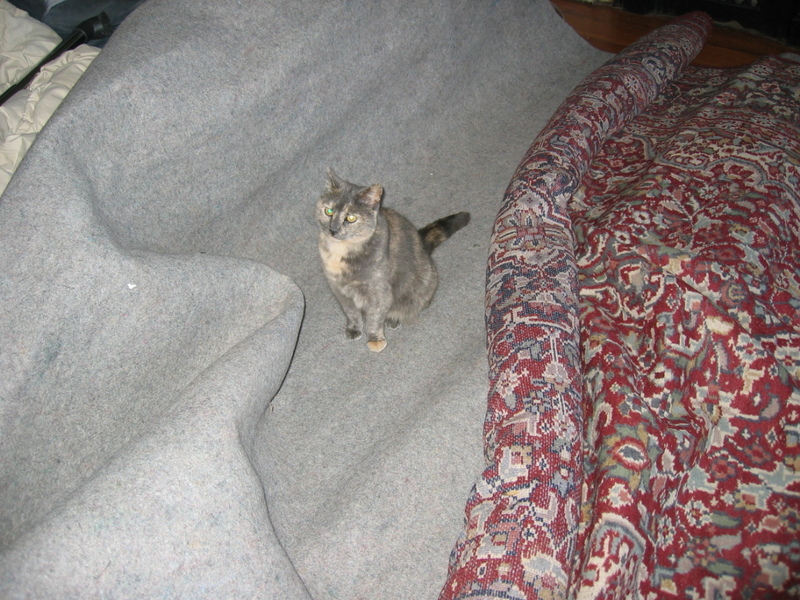 Because she has also barfed on it (see: corn-cob incident) and ripped up the fancy upholstery with her razor sharp talons (that she refuses to allow anyone to touch, so her twice-a-year nail clipping requires three people…), I put a slipcover and sheet over it so it’s less visibly horrifying. This is one of the two rooms where I spend most of my time. It’s on the sunny side of the house, and from the windows, I have a great view of the Springfield Museums and St. Michael’s Cathedral — beautiful architecture all around. My house had been a rooming house (men only, I learned from the grandkids of a previous owner, because they were “less trouble”) for at least 80 years before I bought it. Each man had a gas stove and a sink in his room, hence the lack of a kitchen in the house. This was the last occupied room in the house, and the man who’d been in it had lived there for 20+ years, moving in as an adult to the same rooming house where his dad lived. The younger man still lives in the neighborhood. I don’t think much had been done to the room in the 20+ years he’d been there. 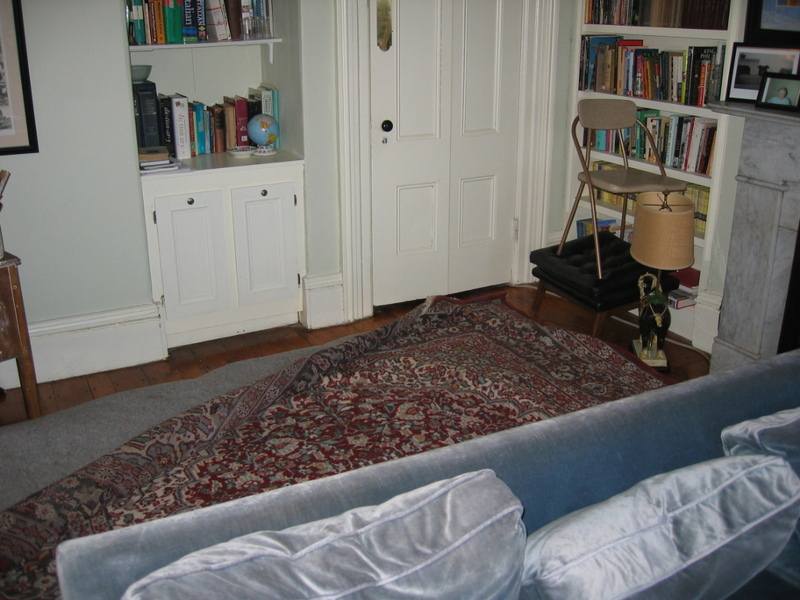 There was grease all over the wall behind the stove (where the bookcase to the left of the fp now stands), the walls had very stained and aged wallpaper, the floor had been painted brown and then linoleum and indoor-outdoor carpet were laid over it. This is a room that cries out for before pictures. They were among the lost photos when the last computer crashed. Sigh. But I can, at least, narrate what was done. I gave everything a good cleaning and had the gas turned off (yup, I still had active gas lines running throughout the house when I moved in). Then I stripped the wallpaper. It came off quite easily, as did much of two walls. The roof collapsed sometime around 2000 (before I bought the place) and there is water damage throughout the house, but especially on the fourth and third floors. This room is on the third floor. So I hired a handyman and he put in two new walls and took out the sink that was in the niche area. Then, I got in touch with the New England School of Architectural Woodworking to see if they took on projects. They do, sometimes. They took on mine, which entailed us working together to design the bookcases. They installed the large single unit one year, then the two on either side of the FP the following year, as well as doors to the bottom of the niche. 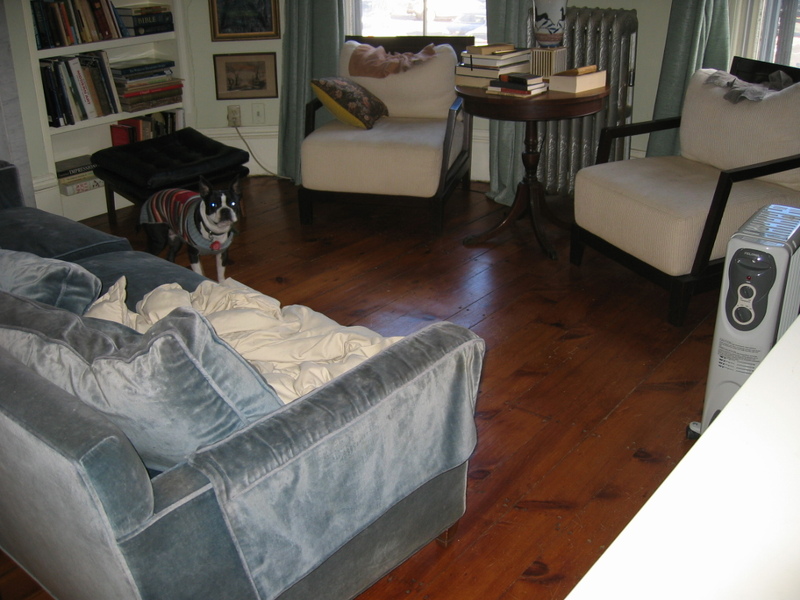 Before the bookcases went in, I removed the ick on the floor and had the floor sanded. Then, I chose my paint colors, and took a stab at peeling some of the caked-on paint from the rosette (this alone took weeks). I got it off and discovered the design was acorns and leaves — very pretty! It had just been blobs before. So I painted away (had to do a bit of ceiling repair, which has held so far, despite a subsequent roof leak…), and found furniture here and there, found rugs there and here, and found a great fabric to sew the drapes at Joanne’s fabric on deep discount. Most of the artwork is by my late grandfather F.L. King, and some are pieces I picked up at auctions and flea markets (where most of the stuff in the house comes from). A few summers ago, I transformed the closet into a little storage area for files and archives. Both the doors in the room (the closet and the entry door) feature a local specialty — the saw down the middle effect. The doors are so big that they take up a lot of floor space when they’re open normally, so several of us have sawed them down the middle so they fold up when open and take up less room. I love this room, as do Skunkie and Jerome, and we spend a lot of family time here — me and Skunkie on the couch and Jerome sitting on the back of one of the chairs. It’s so lovely with the sun coming in, and so cozy at night with the drapes closed. It took about three and a half years to be done, and I’m thrilled with the way the room came out!